The lives of a select number of Australians reflect and illuminate the life and times of the nation itself. This is the story of one such life. For over seventy years, Clyde Cameron has been a member of the Australian Labor Party; for just as long he has been a trade unionist. The ALP and the union movement have shaped his life and, in turn, he has done much to shape their history. 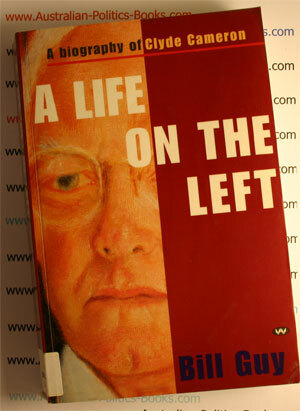 Twice he played a crucial role in determining the direction taken by the Labor Party. Cameron was born on the eve of World War U; he began work in the shearing sheds on the eve of the Great Depression; he is still working - as lecturer, author and historian - on the verge of the Millennium. He graduated from a shearer to a federal cabinet minister. As well as exploring a remarkable life, which a due share of personal tragedy, this biography examines its larger historical dimension. Cameron has been involved in many of the great political events of Australia since World War II ... the Petrov affair; the Labor Split of the 1950s; the Vietnam war; the quashing of Victoria's Socialist Left, which cleared the way for the election of the Whitlam Government in 1972; the dismissal of that Government three years later. The sub-plot is a story of betrayal - the perceived betrayal of Labor idealists such as Cameron by the seeming abandonment of the party's traditions and principles in the later Hawke-Keating years. Cameron spells out his vision of a reinvigorated party with practical policies that would set a prosperous course for the nation in the 21st century. Add to this the account of one of the most fascinating feuds in Australian history - between union book Tom Dougherty and Cameron, the anti-corruption crusader - and the result is a book of sustained appeal. Clyde Robert Cameron (born 11 February 1914), Australian politician, was a member of the Australian House of Representatives for 31 years from 1949 to 1980, a Cabinet minister in the Whitlam government and a leading figure in the Australian labour movement for forty years. Cameron was born in Murray Bridge, South Australia, the son of a shearer of Scottish descent. He was educated at Gawler, but left school at 14 to work as a shearer. He was unemployed during the depths of the Great Depression, an experience he never forgot or forgave. During the rest of the 1930s he worked in every Australian state and in New Zealand. He was active in the Australian Workers Union and the Australian Labor Party from an early age, becoming an AWU organiser and then South Australian State President and a Federal Vice-President of the union in 1941. From 1943 to 1948 he was the union's industrial advocate and taught himself industrial law. In 1946 he became State President of the Labor Party. In 1939 Cameron married Ruby Krahe (always called "Cherie"), with whom he had three children. In 1949 he suffered a personal crisis when all three children were afflicted with poliomyelitis (infantile paralysis). He also learned that his youngest son suffered from an intellectual disability. Although they all eventually recovered from polio, the ordeal permanently affected Cameron, and contributed to the breakup of his marriage. In 1966 the Camerons were divorced and in 1967 he remarried to Dorothy Bradbury. Cameron was the most powerful figure in the South Australian labour movement in the 1940s, and at the 1949 election he was elected to the House of Representatives for the safe Labor seat of Hindmarsh, leaving his brother Donald (later a Senator) in charge of the South Australian AWU. He rapidly made his mark as one of the most aggressive and uncompromising Labor members ever to enter the Australian Parliament. Cameron hated the conservatives with a deep and personal hatred, and made no secret of it. He rapidly emerged as one of the leaders of the left-wing of the Caucus, led at that time by Eddie Ward, who became Cameron's mentor. It was the tragedy of Labor politicians of Cameron's generation that Labor spent 23 years in Opposition from 1949 to 1972, and he like many others spent his best years out of office. During the Labor Split of the 1950s Cameron became a leading supporter of federal Labor Leader Dr H.V. Evatt and an opponent of the right-wing Catholic faction. He was among those who insisted that all the "Groupers" be expelled from the party. He also conducted a long feud with the right-wing federal leadership of the AWU led by Tom Dougherty, one of the long list of people Cameron hated. Nevertheless Cameron was an intelligent and able parliamentarian, and by the 1960s he could see that Labor would never win a federal election again unless it could find both a leader and a set of policies acceptable to an increasingly middle-class electorate. Ward's death in 1963 marked the end of the old Depression-era leftism in the federal Caucus. The younger left leaders such as Cameron, Jim Cairns and Tom Uren were more willing to adapt to changed circumstances. Cameron became increasingly critical of Arthur Calwell's leadership, although he supported Calwell in his passionate opposition to the Vietnam War. Calwell retired in 1967 and was succeeded by Gough Whitlam. Although he disagreed with Whitlam on many issues, after 1968 Cameron became a supporter of Whitlam's leadership. In 1969 Whitlam made Cameron Shadow Minister for Labor, giving him a real stake in a Labor victory. It was Cameron's decisive influence that gained Whitlam the numbers on the Federal Executive, and in 1970 he supported Whitlam's move to reform the Victorian branch of the Labor Party, which was controlled by the extreme left. In December 1972 Labor came to office under Whitlam, and Cameron became Minister for Labour at the age of 58. He created a sensation by sacking the permanent head of his department, Sir Halford Cook, and bringing in an outsider: he was always deeply suspicious of senior public servants. But he greatly improved the pay and conditions of other public servants, using the public sector to set new benchmarks which he hoped would be extended to the private sector. Revealing himself to be an unsuspected feminist, he hired Mary Gaudron (later the first woman on the High Court bench) to argue before the Arbitration Commission for equal pay for women workers. His senior advisor was John Bannon, later Premier of South Australia. The unions had high hopes that Cameron would bring greatly improved benefits for industrial workers. But unfortunately for Cameron, the Australian economy began to deteriorate rapidly in 1974 as a result of the inflation caused by the oil shock, and the government came under increasing pressure to hold back wage increases, which were seen by orthodox economists to be fuelling inflation. Cameron resisted this pressure and his relations with Whitlam deteriorated. At the same time, he became increasingly critical of union leaders who, as he saw it, blindly pursued wage rises without regard to the state of the economy, or to the incomes policy of their own Labor government. By 1975 the Whitlam government was in crisis and Whitlam made a sharp turn to the right, bringing in Bill Hayden as Treasurer and James McClelland as Minister for Labour. Cameron refused to resign as Labour Minister and Whitlam was forced to ask the Governor-General, Sir John Kerr, to withdraw his commission. He was eventually persuaded to accept the position of Minister for Science. Cameron thus became once again Whitlam's implacable enemy, but with the fall of Whitlam's government in November there was little he could do. He withdrew to the backbench and in 1980 he retired from Parliament. In retirement he published several volumes of vindictive but amusing memoirs. He kept a diary throughout his career, but shortly after his retirement these were (he claims) stolen from his home by ASIO agents. Cameron remained a frequent contributor to public debate well into his 80s.